As regular readers of Londonist know, we've got a fairly strong nerd contingent; comes with the blogging territory, really. 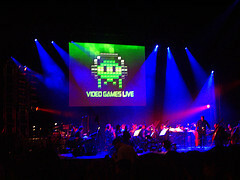 So did you really think we'd stay away from Video Games Live, which took place at the Hammersmith Apollo on Saturday night? Bit of a no-brainer. "[V]ideo games, like ridicule, are nothing to be scared of. Anyone who isn't hopelessly addicted should be regarded with suspicion. Don't like pixels? Think games are shallow? Shut up and learn to love the joypad." People who can't join in on conversations about "my favourite memory from the Zelda series" - is it when you take the ghost back to his cottage, or when you go into the Dark World for the first time and realise you have EIGHT MORE DUNGEONS to get through? - or "what level I reached in the Emperor's Secret Order in TIE Fighter" are like those poor weirdoes who can't join in on nostalgic chats about Count Duckula and Trapdoor and Henry's Cat because their fascist parents never let them near a TV screen. We pity them. The concert itself - well, what can we say? It was bloody fantastic, a treat from start to finish, and honestly one of the best live events this Londonista has ever experienced. Hosted by a very croaky Tommy Tallarico, the audience was treated to the sweet, sweet sounds of such gaming legends as the aforementioned Zelda series - which medley was alone worth the price of the ticket, Mario, Final Fantasy VII (although the spoilsports at Square wouldn't let any footage of FFVII be used - boo), Halo, Sonic, Medal Of Honor [sic], Metal Gear Solid, Civ IV, Beyond Good & Evil ... and, er, Advent Rising. Advent Rising? Never heard of it; Wikipedia says delicately that "the game's retail performance fell below expectations". So it was a flop then. But wait, what's this? The music for Advent Rising was composed by a certain outfit called Tommy Tallarico Studios, eh? Goodness, what a coincidence ...! We will allow Tommy his little flight of vanity, however, as the music was pleasant enough, and the rest of the show rocked. There were too many highlights to list here, but they included: the live, on-stage Space Invaders, where one happy geek was given a fire button and told to run from one end of the stage to the other in order to control his ship; the Nintendo Wii demonstration beforehand (as an aside, we found this spoof video about the relative merits of the PS3 and the Wii quite amusing, despite identifying rather too closely with Ms PS3), although it was almost impossible to see what was going on past people's silly hats; the live, on-stage Frogger duel where one lucky young Aberdonian walked away with a laptop worth $2,500; the stunning visuals on the big screen which went perfectly with the music; the spine-tingling way the choir sang "Saaaaaaaaaay-gaaaaaaaaaaah" at the beginning of the Sonic medley; the video interviews with, among others, Koji Kondo, the stupendously gifted composer of the music to such Nintendo classics as Mario, Zelda, and Starwing; the beautiful lighting which added so much to the experience ... sorry to gush, but it was a truly uplifting experience. *cough* OK, normal service will resume now. The only slight letdown were the references to a certain soulless, content-stealing website called Ebaumsworld that we are NOT going to link to because we loathe it and its bottom-feeding twunt of a webmaster, Eric Bauman. The subject arose when Martin Leung came onstage to perform his bravura Mario piano arrangement, blindfolded; if indeed he owes his internets fame to the thieving Bauman, then he is one of a lucky few who have not been screwed over by the content-sucking advertising whore. Righty, rant over. Oh, and the beer sucked, too - since when was it normal to pay £3.50 for a pint of cat's piss, oops, Carling? Can no-one stop their relelntless attempt to associate live music with bland fizzy alcoholic witches' brew? In conclusion, then: Roll on next year. Geeks of London, unite, and ignore those who would mock you. 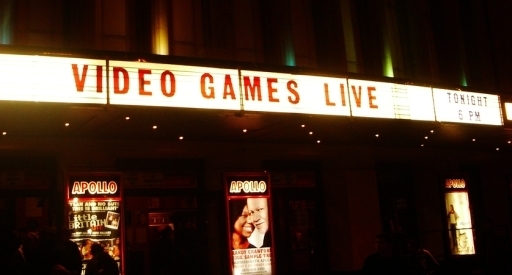 That the multi-billion pound gaming industry is coming of age is amply proved by VGL, were such proof even needed.